IN 1925 the Scopes “Monkey” Trial galvanized the nation. It alerted intellectual elites to fundamentalism for the first time and, in the same blow, led them to think (erroneously) that fundamentalism had been humiliated forever. One of the most memorable moments in the Scopes courtroom made its way, virtually unaltered, into Inherit the Wind, the fictionalized 1950s drama based on the trial. The play and subsequent film were as much about attacking the anti-Communist tactics of 1950s senator Joseph McCarthy as they were about the actual trial. Like so many other teenagers of the 1970s and 1980s, I first encountered the drama in high school. Darrow: What do you think? Bryan: I do not think about things I don’t think about. Darrow: Do you think about things you do think about? 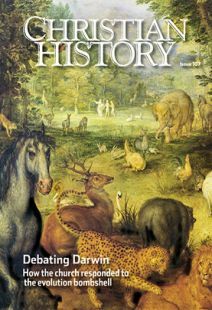 Some months ago our senior editor, Chris Armstrong, suggested we devote an issue to the intersection of Christianity and science; specifically, to the Christian response to Charles Darwin after the British naturalist published his On the Origin of Species in 1859. Or, more properly, the Christian responses, because they varied widely. I took on the project with trepidation, knowing well how the topic evokes many emotions. As we prepared this issue, I read many of those responses—from Christians along the whole theo- logical spectrum, from scientists of all Christian persuasions and of no faith persuasion at all, and from authors who found in Darwin the ammunition they were looking for to attack Christianity. And that exchange from the Scopes Trial has been echoing in my head. There were so many things I thought I knew as a lifelong Christian and as a historian of American religion: about Darwin, about nineteenth-century Christianity, about nineteenth-century science, and about who took up which positions and why. Even about Scopes, Bryan, and Darrow. Nearly all of those things turned out to be more complicated than I thought. History usually does. On this contentious issue, many of us don’t think about things that, perhaps, we should think about. At least sometimes. I invite you to read the articles in this issue from that perspective. You too may find some- thing new here to think about. Please prayerfully consider a generous gift to keep Christian History alive and well. Your gift will help maintain Christian History magazine in print and on the web for many who wouldn’t otherwise have access to it.